OFI Australia is so happy and appreciative to have the support of RARE Bags. Home Page > Supporters > OFI Australia is so happy and appreciative to have the support of RARE Bags. Home > Supporters > OFI Australia is so happy and appreciative to have the support of RARE Bags. RARE (Recycle And Reuse Everything) Bags, aim to raise awareness of the damage being caused to Mother Earth including wildlife through loss of habitat and human / animal conflict. Their bags are crafted in Australia from eco-friendly and recycled materials. Each bag is unique in design and displays multiple patches. 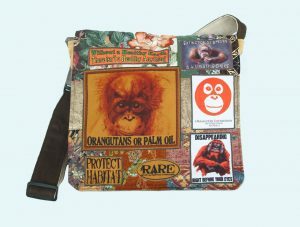 The OFI Australia RARE Bag will display the OFI Australia logo patch and others specifically related to orangutans, palm oil and loss of rainforest habitat. RARE Bags is proudly supporting OFI Australia with a $10 donation for every exclusive OFI Australia RARE Bag purchased either through the OFIA Australia website shop or directly through the RARE Bags website.